16 Oxfordshire firefighters have been tackling a farm building fire containing gas cyclinders in Charney Bassett near Wantage since the early hours of this morning. At 0430 on Sunday 3 July, Thames Valley Fire Control Service received a call, reporting a building on fire at Brook Farm in Charney Bassett. 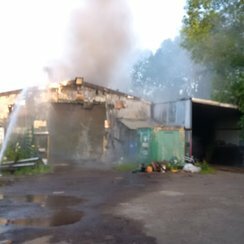 Crews from Faringdon, Abingdon and Rewley Rd in Oxford Fire Stations were immediately dispatched and on arrival found a single storey building 20m x 10m which housed farm equipment and machinery totally involved in fire. It was quickly established that the building also contained several gas cylinders, including acetylene, which when involved in fire is extremely dangerous. At its height, 16 personnel were in attendance and used firefighting jets and an open water supply to contain the fire, whilst attempting to cool any cylinders with ground water monitors. The cause of the fire is not thought to be suspicious, but due to the required cooling of gas cylinders crews will be on site throughout the day.